Recently I’ve been seeing a lot of bloggers jumping back on the ‘Blogger Made Me Buy It’ bandwagon and back in the day I did to, as it totally made splurging justifiable by ‘blaming’ it on the many beauty reviews us bloggers read on a daily basis. I thought it would be fun to an updated version on some recent beauty buys, that without blogging I probably wouldn’t have bought let alone know about. As I’ve touched on in a few recent posts from my Australia splurges, a lot of the products that I purchased have been on my wish list for such a long time due to so many bloggers raving about how amazing they are, but I wanted to hold off buying until I could actually see the products in the flesh and get a feel as to whether i’d like them. It’s safe to say that I’ve hardly ever been left disappointed by an overly loved product within the blogging community, and most of these products i’d recommend to anyone out there. An obvious brand to kick things off with has got to Anastasia Beverly Hills, with a large number of products absolutely adored amongst the community and this year I finally added a couple of products into my collection that I’ve wanted to try for such a long time. 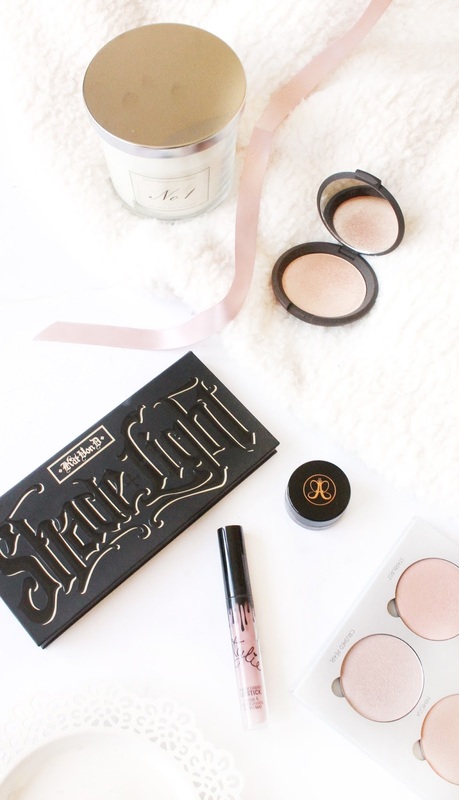 For my birthday this year my Dad kindly got me the ABH Gleam Glow Kit (£39), which unfortunately has been discontinued to make way for their new releases of their glow kits but that doesn’t take away from the fact their glow kits are absolutely stunning. It’s safe to say they definitely deserve every bit of love that they get as they changed my entire opinion on highlighters, and I’ve since gone onto adding so many highlighters into my collection. Another product from ABH that I wouldn’t of purchased if it weren’t for endless raving reviews is the ABH Dip Brow Pomade (£15) , which granted I’ve only had for a couple of weeks but it has changed my brow game for the better! I love how defined they look and for the first time in my life I can say that my brows look ‘on fleek’! Another highlighter, that has been a recent addition into my highlighting collection is the Becca Shimmering Skin Perfector (£32) in the shade Champagne Pop, which if it weren’t for the fact that product is in conjunction with one of the biggest beauty Youtubers, and absolutely loved by so many then I wouldn’t of even given this product the time of day. When I first laid eyes on this Sephora I was instantly sold. It’s absolutely beautiful and looks stunning even on pale skin like mine! Another product that when I first laid eyes on I was instantly sold on was the Kat Von D Shade & Light Contour Palette (£37). Ever since Kat Von D launched in the UK my interest in trying out the brand only grew and grew, so when faced with the opportunity to purchase a few products I of course had to pick up this well know and well loved palette. I’ve been using this non stop for around three weeks now and I absolutely love it! Moving onto a beauty brand that has had a lot of talk, especially over the past 12 months or so, both good and bad is Kylie Cosmetics. When I heard that Kylie Jenner was releasing her own cosmetics line I knew i’d instantly be backing it, purely because i’m obsessed with the Karadshians. Initially I held off ordering in order to see the first round of reviews, as I really rely on bloggers reviews nowadays and after a few months I decided to purchase her Candy K Lip Kit ($29). I can honestly say that these liquid lipsticks started my love for liquid lipsticks, and I’ve since gone onto try so many different brands and the Kylie Cosmetics one are hands down my favourite and most worn! So those are a few recent additions into my beauty collection that without us bloggers I would have never dreamed of purchasing! What products have you bought purely because of blogger reviews?